Despite the important role your roof plays in keeping you, your employees and your customers safe, roof maintenance is often sadly overlooked. Regular roof maintenance ensures compliance with all state and local building regulations, profitability and a good reputation within your local community. Choosing a company to help you maintain your roof’s “health” is almost as important as the upkeep itself. 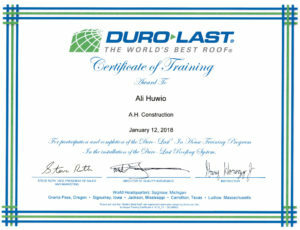 At A.H. Construction & Roofing Company, we have expertly and efficiently serviced commercial roofs for nearly 3 decades. We have installed or repaired roofs on every type of commercial business in Ypsilanti and Southeast Michigan including restaurants, grocery stores, churches, schools, factories, apartment buildings, and condominiums. No matter what kinds of issues you are having with your commercial roof, rest assured that A.H. Construction & Roofing Company will do everything to get your roof back to top condition once again. As a fully-licensed and fully-insured roofing installer and contractor, we offer the full lineup of commercial roofing services including interior and exterior roof inspections, tear-offs, copper flashing and valley repairs, snow removal, emergency roof leak repairs, re-roofs and new installations. Best of all, we have worked with every type of roof there is from metal to cedar shake. So when you entrust your roof to our team, you can feel confident that we are not only meeting your roofing, but exceeding them. Insurance claims assistance so you can get reimbursed faster. We know that owning and running a business can be very difficult. Make at least one easy decision by choosing A.H. Construction & Roofing Company to handle all of your roof needs. Call us today at 734-481-1983 for a free consultation.